HARD OPERATING CONDITIONS WITH BILLETS & SLABS. 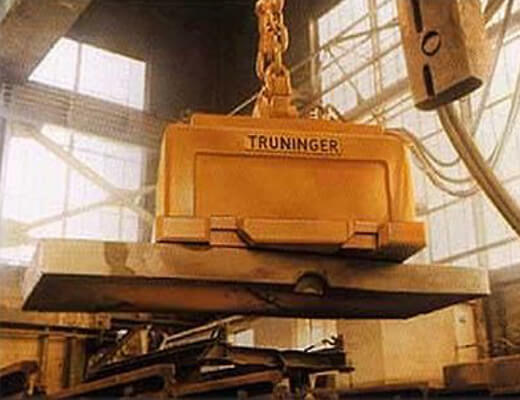 Even heat radiation, which is emitted from freshly cast billets and slabs, can be handled with TRUNINGER lifting magnet equipment. Thermal insulation of the poles, as well as a ventilated double bottom plate, prevents the external heat of the load affecting the magnet. 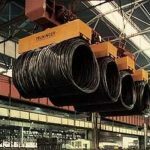 Heat resistant solenoid coils enable the handling of hot steel up to 600°C, i.e. close to the limit of the electromagnetic lifting principle [See Photo 1 Below]. TRUNINGER’s large application experience, as a manufacturer of magnetic lifting magnet equipment, allows us to also offer solutions for unusual tasks. 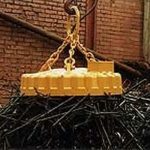 For example the magnetically lifted load can be additionally secured with mechanical gripper arms.